My BFF Laura Ann had her 30th birthday a couple of weeks ago, and I am late with her present. But I finished it this week, and I love it. 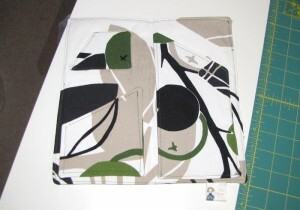 I tweaked the design for this travel wallet from the “E-Ticket Wallet” by Kevin Kosbab in the Spring 2009 issue of Stitch magazine. His was grey felt with an applique airplane on the front. 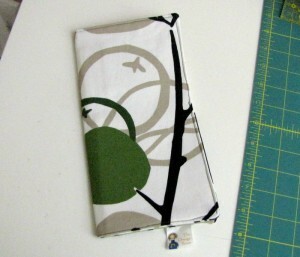 I decided to make this one using some of this great home dec weight fabric from IKEA instead. Because it’s not as thick as felt, I reinforced both the inside and outside with thick fusible interfacing, and I lined all the pockets and also used fusible interfacing. It was tough getting all the measurements right. The felt version didn’t require lining or finishing at the edges because felt won’t fray like regular fabric. Because of this, it took me 3 tries to get the passport pocket (bottom left side) the right size and 2 tries to get the driver’s license pocket (top left) right. Instead of just cutting out the fabric and topstitching it onto the inner lining of the wallet, I made 3-layer patches out of each pocket (heaven help me if the boarding pass pocket on the right side isn’t wide enough). This messed up my measurements a lot, but I think most of that is due to me attempting to make this while recovering from this bug I’ve had for 2 weeks. Things I can normally do in my sleep have been taking lots and lots of extra effort. But, in the end I got it finished the way I want it. I’ve had this fabric for ages, and I couldn’t think of a worthy project for it. But this was perfect, and it’s a really great way for a fabulous jetsetter like Laura Ann to hold her paperwork in one place while she goes through security. I am always fumbling around with my travel paperwork in airports, so I might make myself one of these, too, to keep it all together in the future. Unfortunately, Laura Ann is in London for a week, and I didn’t get this to her in time. So it will have to wait for her next trip.